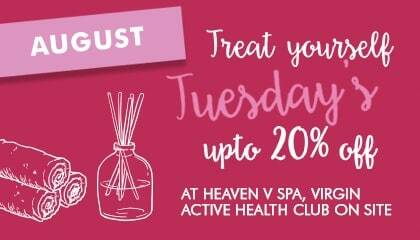 Treat yourself Tuesdays with Heaven V Spa! As part of treat yourself Tuesdays at Blythe Valley Park – Heaven V Spa are offering 20% off 25 minute massages, facials AND file and polishes! This offer can only be redeemed on Tuesdays in August 2017 between the hours of 1pm and 4pm. The appointments will be on a first come first serve basis and can only be redeemed at Virgin Active Solihull Health Club – the number to call to book at appointment is 0121 506 9880 please quote ‘Treat yourself Tuesdays’ when calling. Guests can park at Virgin Active Blythe Valley Park. Don’t waste anytime – book now!